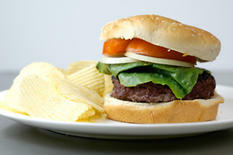 All entrees served with your choice of salad, bottled water and chocolate chip cookie. Chicken Breast topped with fresh diced basil, sliced tomato and shredded mozzarella cheese served with parmesan parsley roasted potatoes and zucchini wedges. 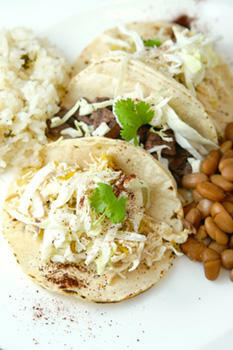 Fresh corn tortillas served with cilantro-lime rice, pinto beans, salsa & chips, shredded cabbage and cilantro sauce. Please note this menu option does not include salad. 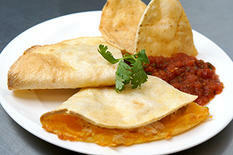 Corn tortillas stuffed w shredded chicken w green chilis, served with cilantro-lime rice, pinto beans, chips & salsa. 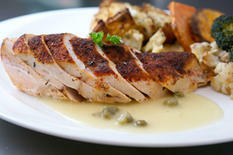 Chicken breast in a lemon caper sauce. Served with rice pilaf and vegetable medley. 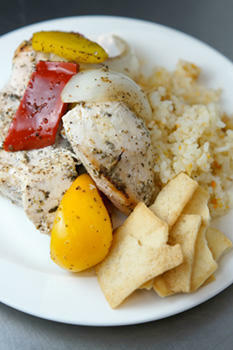 Marinated cubed chicken topped w sautéed bell peppers and onions, served w rice pilaf, tziki, hummus, cucumber slices and pita chips. Stuffed with cornbread stuffing and/or spinach and feta. Served with rice pilaf and vegetable medley. 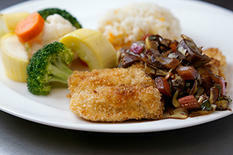 Panko breaded chicken breast, topped with diced artichokes, tomatoes, onions, fresh basil, and seasonings. 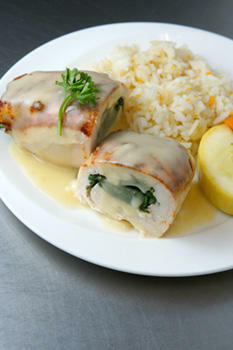 Served with orzo or rice pilaf, and vegetable medley. 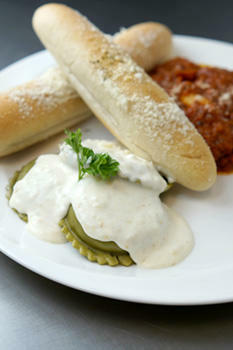 Cheese ravioli in marinara sauce, meat ravioli in marinara sauce, and spinach and gorgonzola ravioli in alfredo sauce. Served with garlic parmesan breadstick. 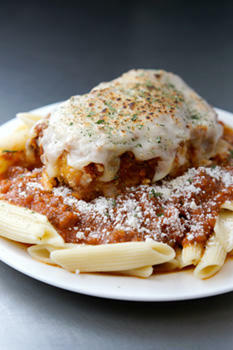 Served with penne marinara, penne alfredo and garlic parmesan breadsticks. 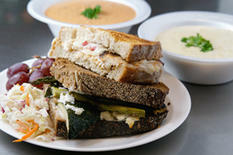 1/2 toasted sandwich (chicken & veggie sandwich), soup (tomato basil & cheddar broccoli) & salad. 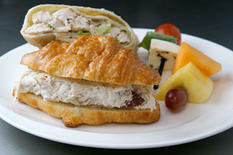 Assorted cold sandwiches and wraps. Marinated Chicken Breast w Sesame Oriental Glaze served sliced on platter with Roasted Veggies (sweet potatoes, cauliflower, broccoli, and zucchini) with Garden Salad, Caesar Salad and Orzo Salad. This is a cold lunch menu. 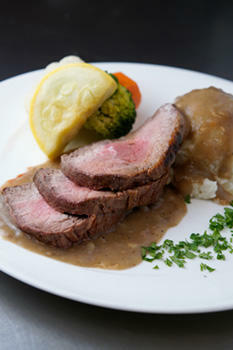 Served with brown gravy, mashed potatoes and vegetable. 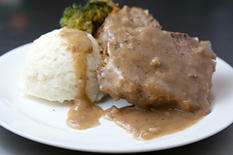 Tender roast beef in brown gravy. Served with mashed potatoes and vegetable medley. 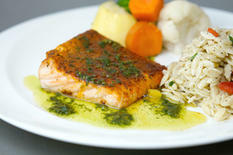 Fresh grilled 4 oz salmon fillet, drizzled with basil pesto. 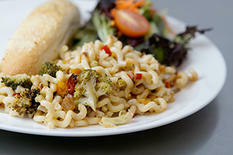 Served with orzo and vegetable medley. 10 person minimum. Sorry, no Breakfast Catering to the East Valley. 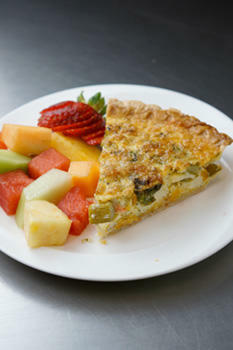 All entrees served with fresh fruit, coffee or orange juice. 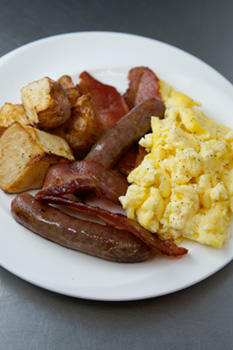 Scrambled eggs, bacon, sausage and roasted red potatoes. 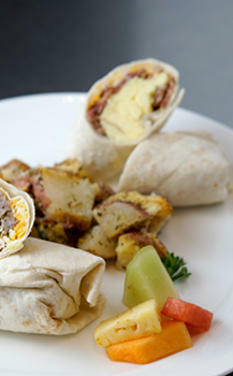 Egg & Cheese Breakfast Croissant (w Bacon and or Canadian Ham), served w roasted red potatoes. 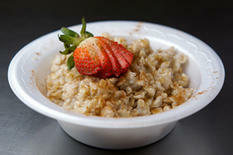 Fresh fruit bowl, assorted muffin platter, assorted bagels & cream cheese, coffee or orange juice. 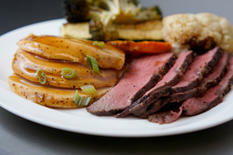 Served with red roasted potatoes. 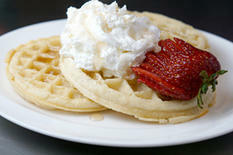 Served with whip cream, strawberries and sausage. 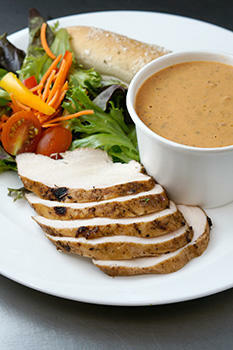 All entrees served with your choice of salad, bottled water and cookie. Penne marinara, penne aflredo, cubed chicken, and garlic parmesan breadsticks. Served with garlic parmesan breadstick. 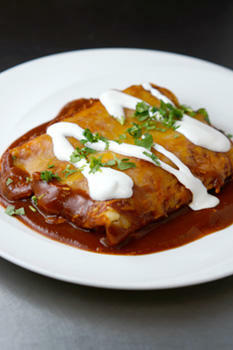 Served with lime cilantro rice, pinto beans, chips and salsa. 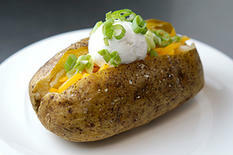 Served with butter, sour cream, shredded cheese, chives, bacon bits. 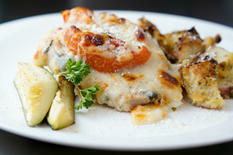 Served with tomato basil soup and garlic parmesan breadstick. 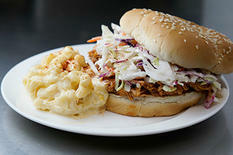 Served w BBQ Sauce & Seeded Bun, Chips and Cole Slaw.